Dicerca pugionata – safe and sound! One of my favorite beetle species in Missouri is Dicerca pugionata—a strikingly beautiful jewel beetle (family Buprestidae) found sporadically across the eastern U.S. Unlike most species in the genus, which breed in dead wood of various species of trees, D. pugionata larvae mine living stems of certain woody shrubs—namely alder (Alnus spp. ), witch-hazel (Hamamelis virginiana) and ninebark (Physocarpus opulifolius) (Nelson 1975). 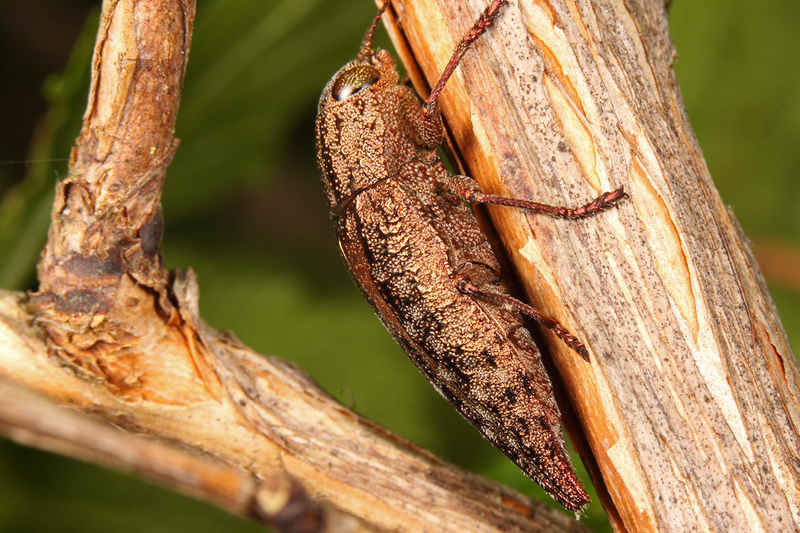 When I first began studying Missouri Buprestidae (way back in 1982), the species had just been reported from the state based on a single specimen (Nelson et al. 1982). I happened to stumble upon these beetles at what became my favorite collecting spot during the 1980s—Victoria Glades Natural Area, just south of St. Louis in Jefferson Co. For several years while I was visiting Victoria Glades, I found these beetles regularly during spring and fall on stems and branches of living ninebark plants growing within the ravines and along the toeslopes at the lower edges of the glades. After finding the beetles at Victoria Glades (and nearby Valley View Glades Natural Area), I made it a habit to examine ninebark wherever I found it growing in Missouri. Ninebark is actually rather common in the state along the rocky streams and rivers that dissect the Ozark Highlands. Interestingly, I almost never encountered this beetle on ninebark elsewhere in the state. I’m sure it occurs in other areas, but probably at too low a level to be easily detected. I surmised that the populations at Victoria and Valley View Glades were unusually high due to the non-optimal conditions for its host plant. The ravines and toeslopes where the plants grow are drier than typical for ninebark, and unlike the lush, robust plants found in moister streamside habitats, the plants at these glades are small, scraggly and often exhibit a certain amount of dieback. It seemed likely to me that the plants growing in the glades were less capable of fending off attacks by these insects, thus resulting in relatively higher numbers of beetles at these glades. After the publication of my “Buprestidae of Missouri” (MacRae 1991), it would be many years before I actually returned to Victoria Glades. When I did return, I was pleased to see that management practices (e.g. prescribed burning, cedar removal, etc.) intended to halt the encroachment of woody vegetation and preserve the glade’s pre-settlement character had been implemented in the area. I was a little bothered, however, by the seeming paucity of insects compared to the years prior to management. I visited the glades again several times afterwards, and not only did insect populations in general seem to be depressed, but I never succeeded in finding D. pugionata adults on the ninebark plants. I began to worry that the prescribed burns, while clearly beneficial to the glade flora, might have had a negative impact on the glade’s insect populations. I’m happy to report that, at last, I have found the beetles again. I returned to the glades in early May this year and, for the first time since 1987 I found the adults of this species—five in all (a typical number for the many dozens of plants checked) and right in the same areas where I had so consistently found them 25–30 years earlier. This does much to allay my concerns about the ability of these beetles to persist in the face of prescribed burning (though I remain convinced that this management technique should be used more judiciously in our state’s natural areas than it has in recent years), and I’m happy to have these new photographs of the species, which are a decided improvement over the old scanned slides taken nearly 30 years ago! MacRae, T. C. 1991. 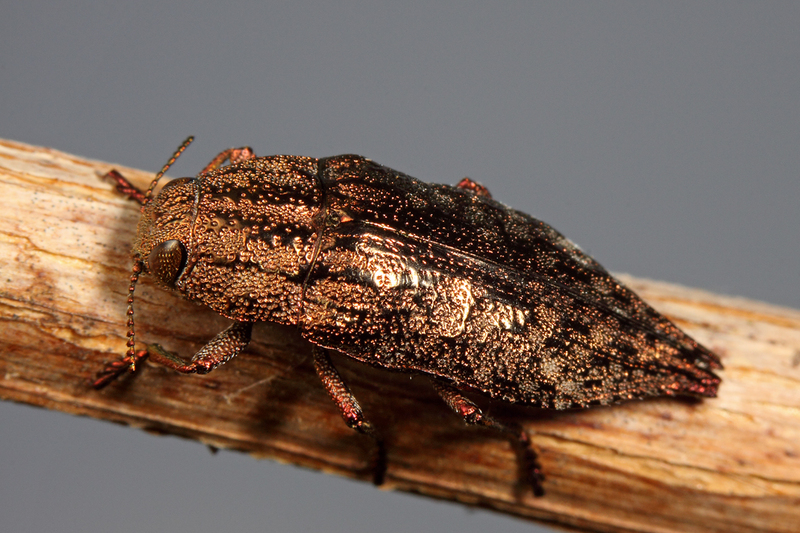 The Buprestidae (Coleoptera) of Missouri. Insecta Mundi 5(2):101–126. Nelson, G. H., D. S. Verity & R. L. Westcott. 1982. 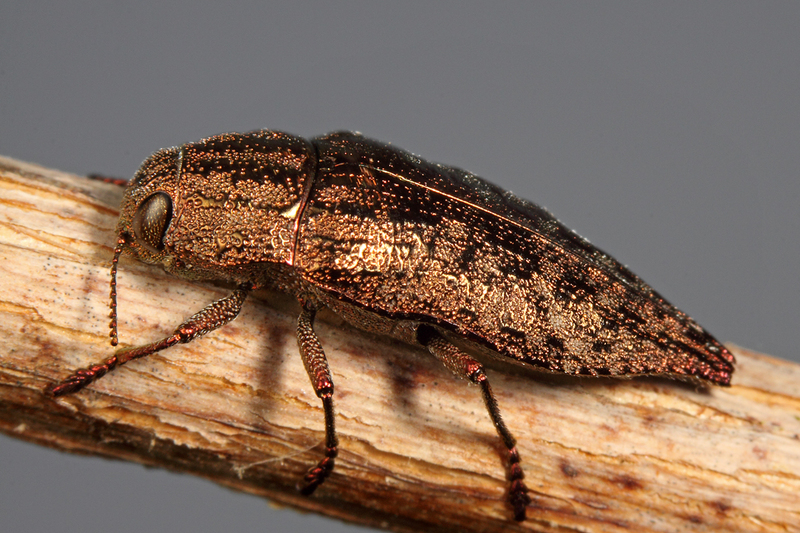 Additional notes on the biology and distribution of Buprestidae (Coleoptera) of North America. The Coleopterists Bulletin 35(2) :129–151. 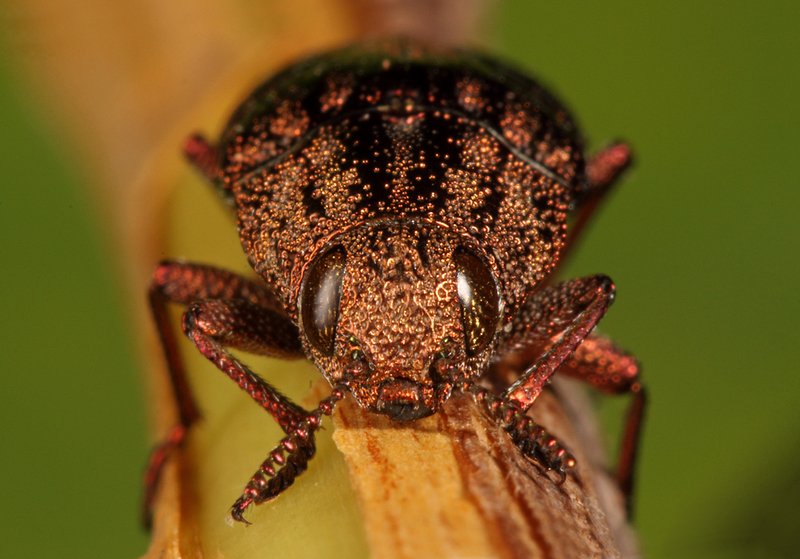 This entry was posted in Buprestidae, Coleoptera and tagged beetles, conservation, entomology, insects, Missouri, nature, science. Bookmark the permalink. 19 Responses to Dicerca pugionata – safe and sound! You know, I swear I saw one of these (or something similar) just last week, kind of randomly too. I was in Clarksburg State Park up here in Massachusetts where I usually go for many of my bug photos, and I was in an open area when a beetle zipped wildly through the air and abruptly landed on me. I thought it was one of the drab click beetles I often see, but I noticed its unusual sparkling in the sun and tapered abdomen (or I guess it’s the elytra, really?). About the same color, I’m pretty sure. But unfortunately it flew away as abruptly as it had come to me. No close inspection and no photos, but you have a nice set here, Ted. Face shot is my favorite! To the casual observer all of the species in this genus look very similar, and there are some rather common ones (e.g. D. lurida, D. obscura, etc.) that seem to have the habit of “landing on people” (I think they confuse a standing person with a standing dead tree trunk). Still, D. pugionata seems to occur a little more commonly in the northeast, so it’s possible this is what you saw. This is good news, Ted. I hope you’ll get a chance to “go beetling” at my site this season, following some rather extensive burning this January, and let me know what you find. . . I can tell you now what I’ll find—nothing! Hi Geek – if this is the photo you’re referring to, I’d say it has the gestalt of D. tenebrosa – associated with conifers across the boreal and mountain belts. A firm ID would require examination of the basal antennomeres and last sternum (sorry!). Fabulous pix of shiny beasties, thanks ! SO generous !! Can I use your gestalt too, please ? Always was one to jump on the gestalt bandwagon (until I took an arrow to the knee [skyrim joke, sorry]). I will let you borrow my leftover schadenfreude since I need so little ! I had to look up ‘schadenfreude’, and now I can’t wait for my first opportunity to use it! hehe – watch out ! Schadenfreude is addictive and never actually solves anything even if it is satisfying – like Chinese food !! Did some more looking around and found out about Bernie Krause’s Niche Hypothesis. The idea seems to be that all species evolve to communicate using a range of frequencies. I find this idea fascinating. Humans communicate within a range of frequencies and most of our simian siblings probably fall within a similar range as well. Would you say that there is a diversity among insect species in terms of frequency range used for communication? I know some insects communicate with sound frequencies – leafhoppers and treehoppers, for example, use ultra frequencies that humans can’t hear, while their close relatives the cicadas use frequencies that can very much be heard by humans. 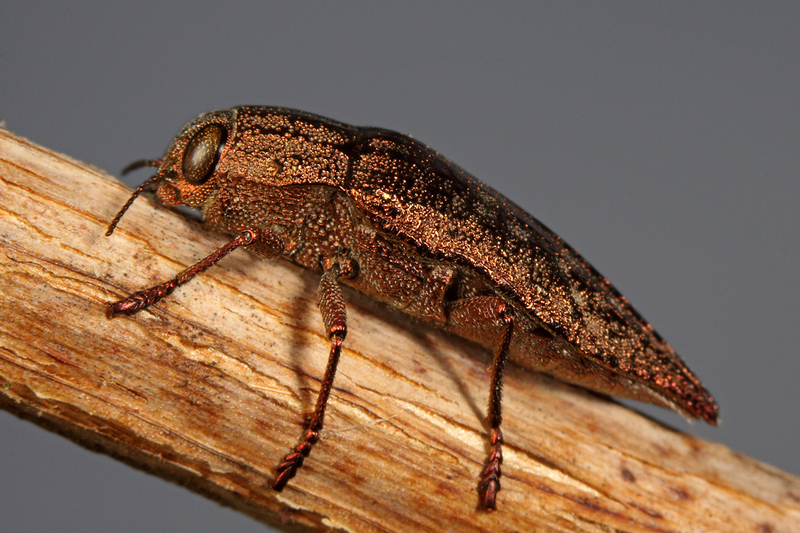 I’m not aware of buprestid beetles having the ability to produce sounds, but many species do ‘tap’ on dead wood with their abdominal tips in regular patterns, so this surely represents some type of sonic or vibrational communication. An interesting subject that I don’t know as much about as I should. Pretty difficult to know as much as we could, since so MANY insects have developed sonic communication so MANY times independently. I know of at least 2 stonefly lineages which have developed abdominal tapping for ‘pair-bonding’ and a multitude of aquatic insects that use stridulation for territorial warning calls. Hi Abby – jewel beetles belong to the family Buprestidae. They are recognized by their elongate, cylindrical, hardened bodies, usually with bright colors and a metallic sheen. Most of them develop as larvae in dead wood, so another common name for them is ‘metallic wood boring beetles’. I like the sound of ‘jewel beetle’ as a common name better!